Charlie Bears Boss Cat Discounts Apply ! Designed by Isabelle Lee for Charlie Bears 2016 Minimo Collection. 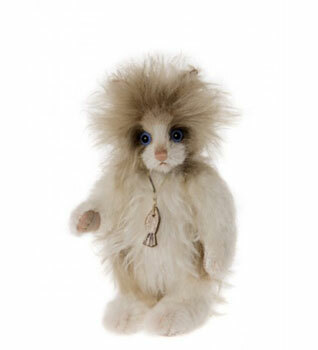 Boss Cat is a stunning little minimo cat made of cream and white mid to long pile mohair and is limited editon so comes with his very own certificate! Boss Cat stands at only 18 centimetres tall and has a rope necklace with a very charming little, sparkly fish on the the end. He is the first of his litter so keep an eye out for some more pawfect friends for him . . . .
Limited Edition of 1200 worldwide. Comes with a numbered certificate of authenticity & FREE Limited Edition Charlie Bears Cotton Canvas Bag.